Get fast, ready access to essential information on the dangerous properties of industrial materials in the millennium workplace. 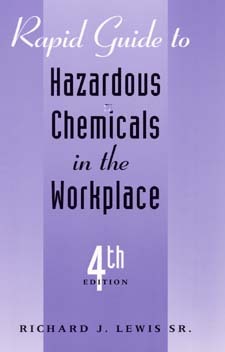 Rapid Guide to Hazardous Chemicals in the Workplace: 4th Edition is an easy-to-use pocket guide to the most frequently encountered hazardous materials is now significantly updated and revised, providing safety managers and workers with critical data and safety profiles for more than 750 chemicals in the millennium workplace. Clear, accurate descriptions for each substance let you assess its health and safety hazards quickly and easily.